I’ve been shunning social media most of my adult life. I neurotically guarded my privacy. However, now that I’ve started a blog, that point is moot. So I’m wading in slowly into the medium. To aid in that effort, cHow Divine is now on Pinterest. You can also find me on Google+. Why Google+ and not facebook? I will eventually get there (to facebook), but my extremely brainy little brother and his equally brilliant wife (my SIL) work for Google. And my SIL highly recommended it. Now. I wouldn’t be a good sis if I didn’t support and love everything Google! So follow cHow Divine on Pinterest and add me to your circle on Google+, and get to know (seemingly) one of the last cyber-hermits on earth. Now that I’ve thoroughly embarrassed my brother as big sisters are wont to do, I will move on to today’s recipe. Cinco de Mayo is coming up. For me, it isn’t a Cinco de Mayo celebration without some creamy guacamole – although my husband would argue that it’s beer. But of course, I need to have it spicy. The guacamole, I mean. It’s in the Korean DNA that weaves into every aspect of my gastronomical life. This isn’t some exotic guacamole recipe. But this has been a foolproof recipe for me. It’s been consistently great every single time. The added benefit is that it’s easy to prepare. And it’s something everyone can enjoy. You can adjust the spiciness to your liking. If you want it mild, just skip the jalapeños and the hot sauce – especially if kids will be present. Everyone in my family loves guacamole, especially my mom. And you can use it on just about anything – chips, tacos, burritos, salads, grains, etc. So when I make it, I make a huge batch. I know. They turn a gross color after a short period of time. But this isn’t inevitable. In fact, I make my guacamole the day before to cut down on cooking time on the day of the event. I will give you the best way (in my opinion) to keep it from turning brown in my next post. I tried to get it all into one post, but it was getting way to long. So I’m giving each subject matter its due respect by giving each its own post. Hope you enjoy this guacamole. I know we do every single time. 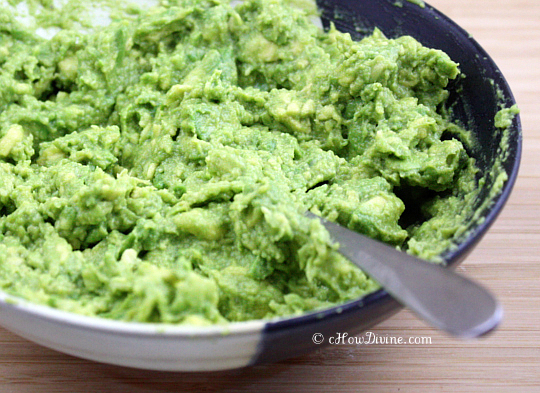 5/2/2012: Big thanks to Organic Authority for including our Spicy Guacamole in their Meatless Monday Recipe Roundup of “top vegan and vegetarian recipes to come out of the blogoshpere all last week!” I’ve shared the article on my Google+ post. *Note: Please make sure to SEED the tomatoes. The guacamole will be really soggy if you leave in all of the seeds and the accompanying liquid. Additionally, IF you are using hot sauce, the amount of hot sauce will differ depending on the hot sauce you are using. If you are using Tobasco, use only about 5-7 squirts. If you are using Frank’s RedHot original, you can use more; you can start with about 1/4 tsp and work up if necessary. Stir together minced garlic and chopped onion with the lime juice. This should take the bite out of the garlic. In a bowl, quickly mash the avocados with a fork until smooth. 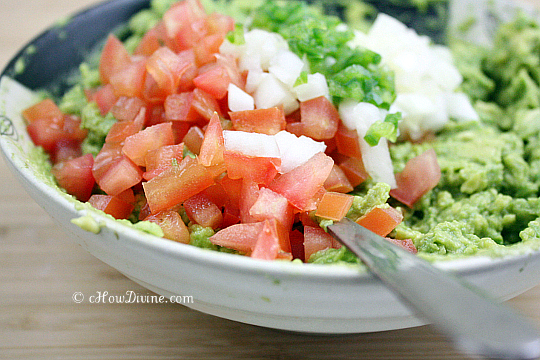 Mix in the garlic, onion, and the lime juice from step 1; make sure to do this right after the avocados are mashed. Add 1/2 tsp of salt, cumin, and cayenne. Mix well. Add the tomatoes, jalapeños, and hot sauce (if using). Mix well. Add additional salt to taste (it wasn’t necessary for me). Serve with chips, taco, burritos, salad, or whatever you’d like! I think I’m the last hermit. I’m not of Facebook and I don’t want to be. haha. I’m starting up on Pinterest though. Gosh, I love your blog so much. I want to eat everything around here. So you are the other cyber-hermit. I knew I felt a kinship with you! 🙂 Thank you for your kind words. It’s always so encouraging and flattering given the fact that I’m not a trained chef or cook. And I LOVE your blog too! 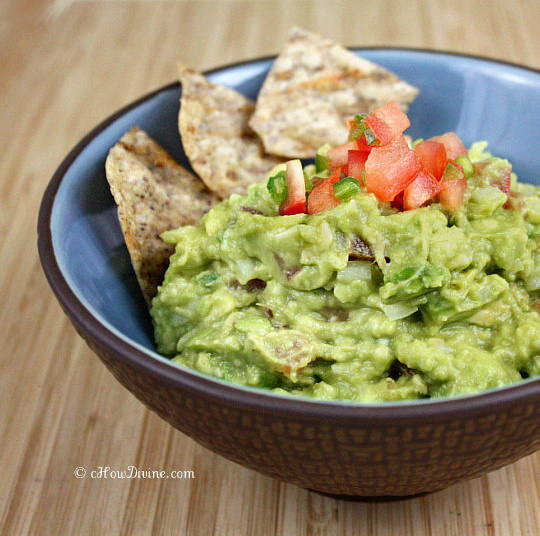 Guacamole is one of my favorite kinds of dips. Thanks for sharing! You’re welcome, LP! Mine too!